Note that all images in this catalogue are taken directly from the videos. A quick reminder that the most recent productions are available on Blu-ray Discs. If you have an HD-ready TV (and a Blu-ray player, of course), you will see a big improvement over DVD. The following volumes are available (£15 each) in unadulterated 1080i High Definition. The images are as sharp as the camera files. 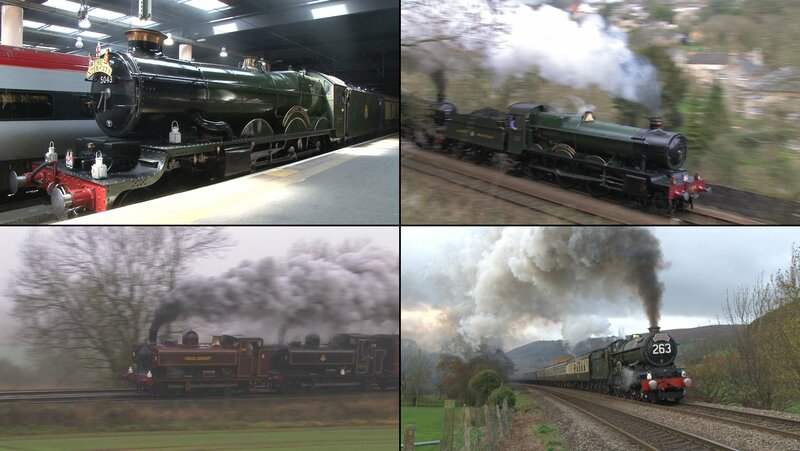 On two discs, highlights of Clan Line’s exploits during her fourth period of mainline running since preservation. 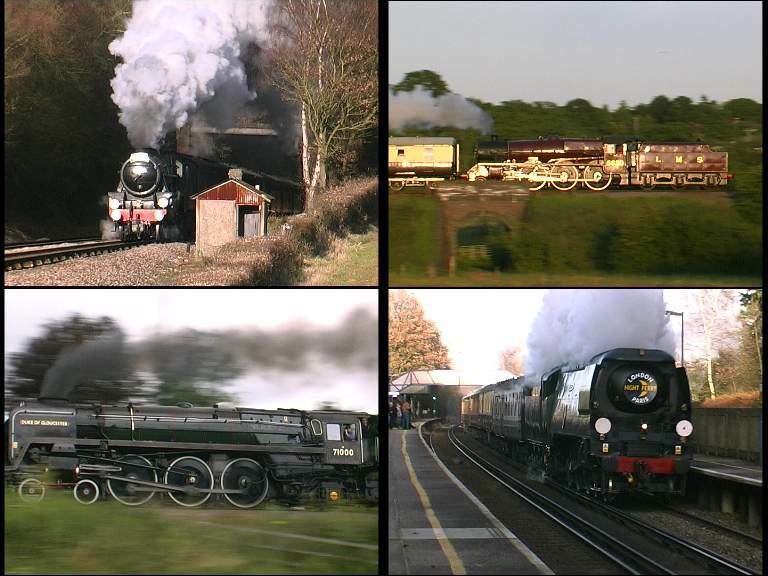 Part 1 covers her work with the VSOE (latterly Belmond) Pullman trains on regular trips to Bristol, Oxford, Southampton and around the “Surrey Hills” circuit. 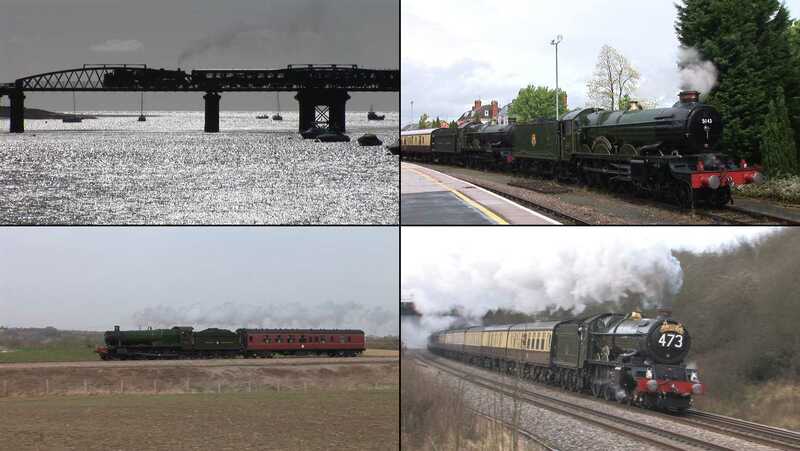 Part 2 shows her work on one-off charters, including The Waterloo Sunset on the 40th anniversary of the end of Southern steam, The Eastleigh Centenarian celebrating 100 years since the opening of Eastleigh loco works, several Cathedrals Express tours and her final run to Crewe for overhaul. Available as a double DVD from the Merchant Navy Locomotive Preservation Society, or as a double Blu-ray direct from Steam Age Pictures. All proceeds from this production will go to the MNLPS. 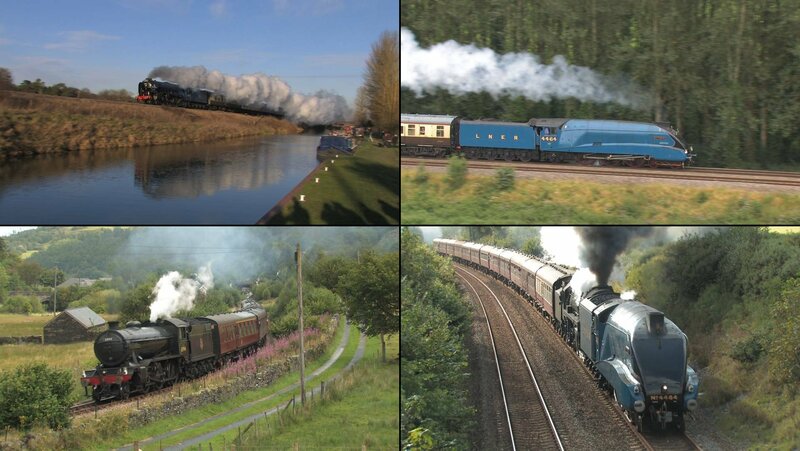 On two discs, a 9-day tour of Great Britain by steam train. The seventh running of The Great Britain visited Falmouth, the Cumbrian coast and several of the Edinburgh-Glasgow routes for the first time. 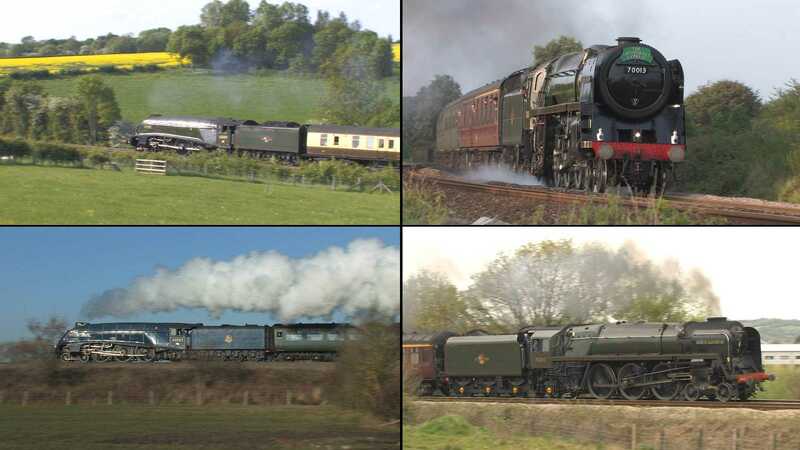 Featuring: 34046 Braunton, 5029 Nunney Castle, 46115 Scots Guardsman, 60009 Union of South Africa, 46233 Duchess of Sutherland, K1 62005, Black Fives 44932, 45407 and 44871. North of Edinburgh, the train was split in two. One half was sent to Aberdeen and Inverness and back, while the other went to Fort William and Mallaig. We have coverage of both parts. The finale was a fast run down the east coast from via Newcastle and York back to London. Day 6 East: 60009 Union Of South Africa at Wardhouse, north of Insch. Available on DVD and Blu-ray disc. Day 5: 44871 & 45407 approaching Pinmore tunnel and restarting from Glenwhilly. 70000 Britannia at Ponthir and Llanfihangel on 23rd November. 70013 Oliver Cromwell at Narroways and Beeston Castle. A 4-day rail-tour from Preston to Fort William, Mallaig and Oban. A 9-day tour of the country. In Part 2, days 6-9, from Edinburgh to Perth, Inverness, Kyle Of Lochalsh, back to Edinburgh, then home to London via York. A 9-day tour of the country. In part 1, days 1-5, from London to Salisbury, Exeter, Newquay, Gloucester, Cardiff, the Central Wales line, Chester, Carlisle, Edinburgh and Aberdeen. Special offer: buy volume 61 and get vol 62 half price. 60163 Tornado in BR green and blue liveries. 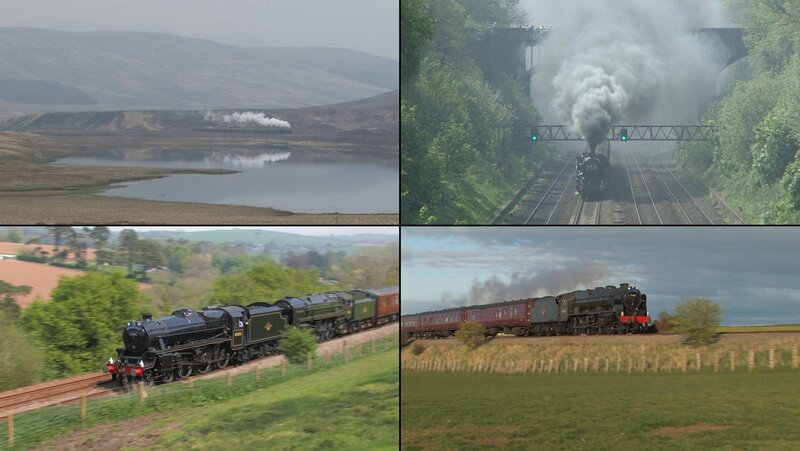 Black Fives 44871, 44932, 45305 & 45407 – on the Settle-Carlise line, in Wiltshire and on the Central Wales line. 46233 Duchess Of Sutherland – on her mainline test, between Derby and York and on Shap. 6201 Princess Elizabeth – climbing the Lickey Incline, hauling the Jubilee Thames Pageant express and Christmas tours in the south. Pannier tanks 9600 & L94 – banking 6201 on the Lickey Incline. The Winter Cumbrian Mountain Express. 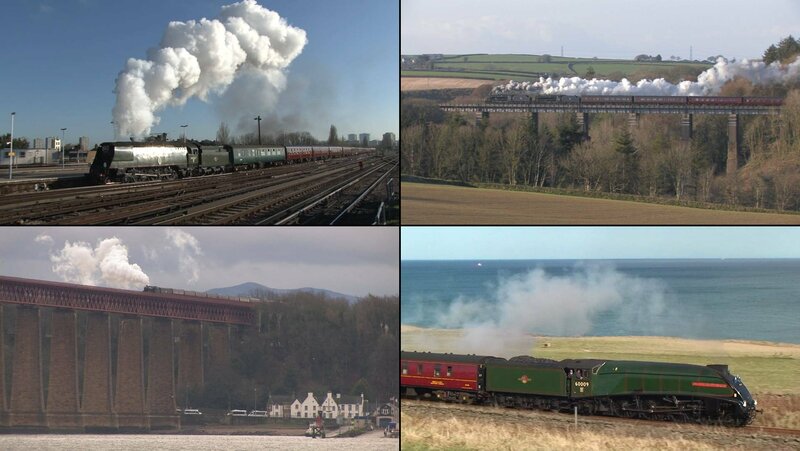 5043 Earl Of Mount Edgcumbe: Bristol-Plymouth, through the Cotsworlds and the marathon 3-day trip to Edinburgh. Panniers 9600 & L94: day trips around the Leicestershire coalfield, to Melton Mowbray and Corby, and to Stratford and Worcester. Steam Railmotor 93: a Sunday on the Liskeard-Looe branch. 5043 at Culross, on the north shore of the Firth of Forth, during the “Castle To Scotland” tour. 34067 Tangmere on Shap and the S&C, by Southern and Western routes to Weymouth, on the Royal Duchy and three winter trains from or to Bristol. 35028 Clan Line with the VSOE Pullmans in Surrey, Oxfordshire and Berkshire, and with The Cathedrals Express to Exeter, Weymouth and Cardiff. 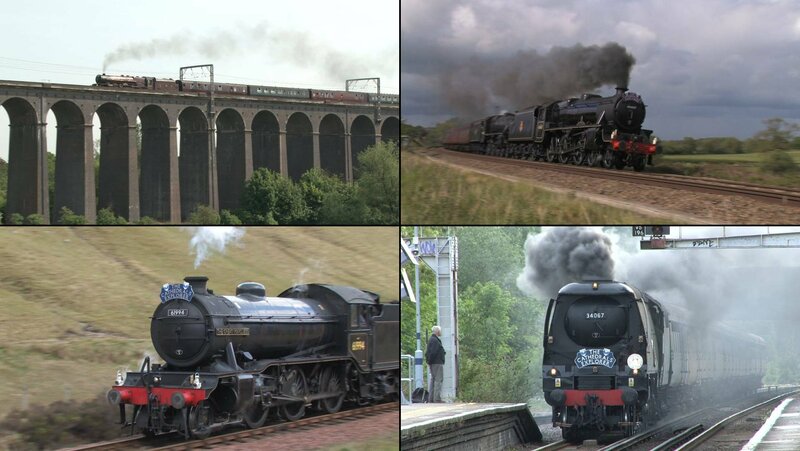 Three of the fastest and most powerful steam locos at work on the British mainline today. 71000 Duke of Gloucester on the West Coast Mainline and along the coast of South Wales. 4492 Dominion Of New Zealand (actually 60019 Bittern in disguise), sometimes running with her second tender to extend her range. 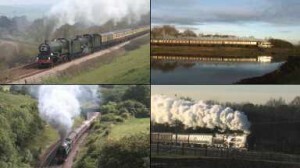 Includes one trip over the South Devon banks piloted by 5029 Nunney Castle. 60163 Tornado returned to work in the summer after several months of repairs to her firebox. Tornado from the North Downs. This shot is not actually on Vol. 54, since we have an even better shot from the same spot taken in December. It seemed a shame to leave it unseen, though. Available on Blu-ray and DVD. Fresh from overhaul, painted unlined black and without nameplates (as during her first few months in service in 1951), 70000 Britannia proved powerful and reliable during 2011. She is seen on her test run, her first revenue-earning train, and 13 other tours around the south of England. 70013 Oliver Cromwell’s third full year of mainline work saw her work from Cornwall to Carlisle and from Holyhead to East Anglia. 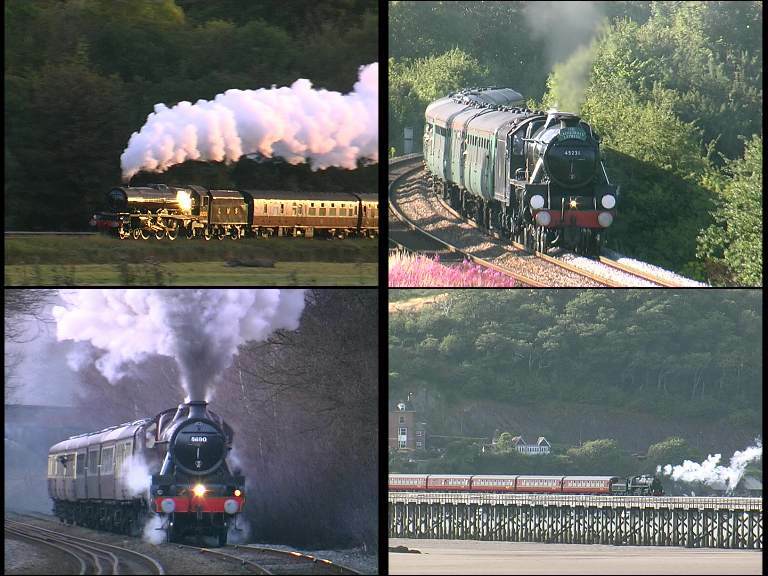 She is seen on seven solo tours and double-heading with 6024 King Edward I over the South Devon Banks. Available on Blu-ray or DVD. YouTube clip: Britannia at Radley and Cholsey, 7th April. 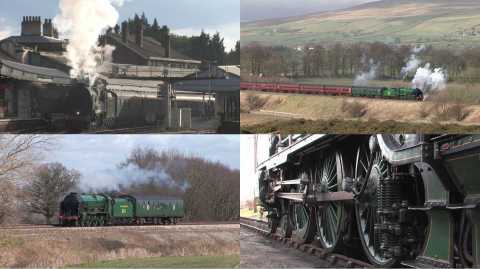 Filmed on the Settle & Carlisle line, Shap, Saddleworth, York, in Devon and Cornwall, Hampshire and Dorset, Surrey and Kent. 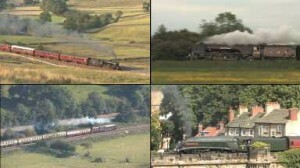 On two discs, 2012’s 9-day tour of Great Britain by steam train. 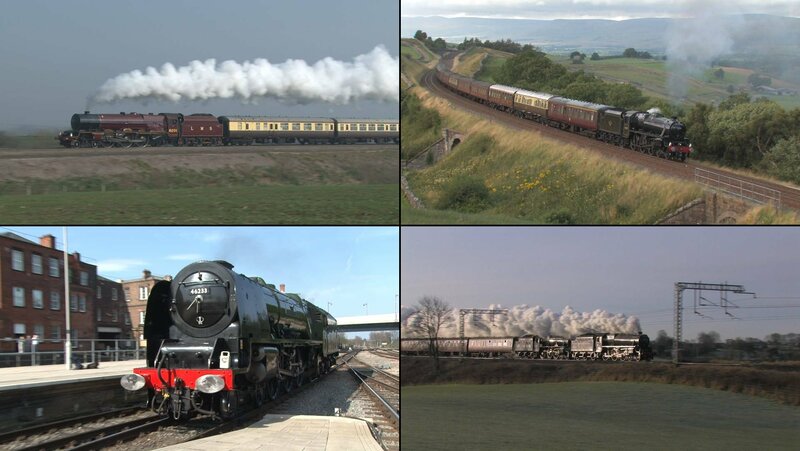 In Part 2: 2 Black Fives to Stranraer, Duchess of Hamilton from Glasgow to Preston, Oliver Cromwell to Shrewsbury and Bristol, Ollie and Tangmere to Penzance and finally Earl of Mount Edgcumbe from Bristol to London via Gloucester. 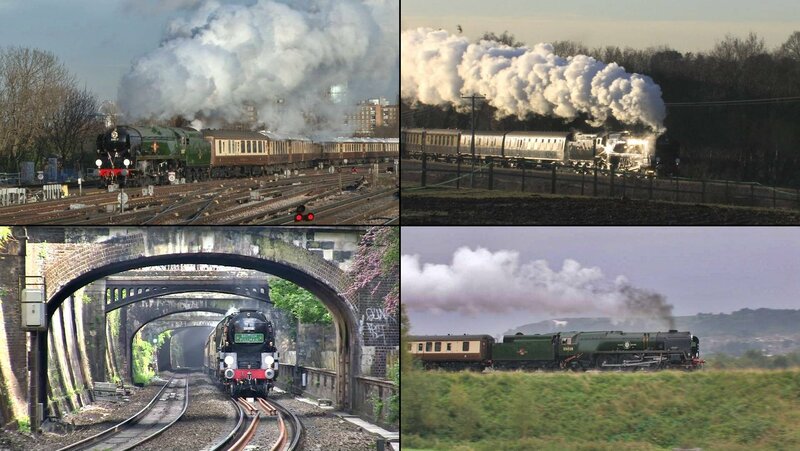 Plus The Royal Duchy: Tangmere & Oliver Cromwell work back from Penzance to Bristol the week after GBV. YouTube clip: Duchess of Sutherland at Smardale and Wilpshire. Special offer: buy volume 50 and get vol 51 half price. On two discs, a 9-day tour of Great Britain by steam train. 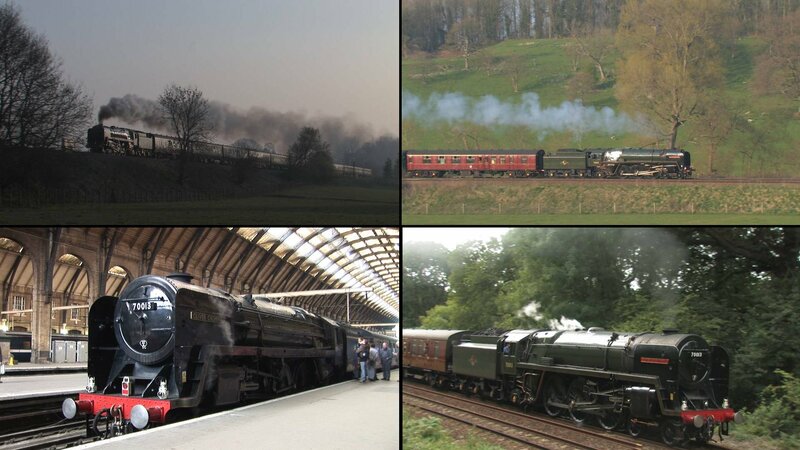 In Part 1: London-York-Edinburgh with Bittern and Oliver Cromwell. To Aberdeen and Inverness with Scots Guardsman, Inverness to The Kyle with 5305 then back to Glasgow with Scots Guardsman. Meanwhile The Great Marquess worked to Fort William and Mallaig and back. YouTube clip: 45305 on the Kyle line. An 8-day tour from London to Scotland, with steam haulage to Edinburgh, Inverness, Kyle of Lochalsh, Aberdeen and back to London. 34067 Tangmere on trains to Weymouth from Bristol and London, to Swanage, between Poole and Bristol, and in Kent. There’s also a special charter departing from St Pancras, surrounded by Euro Stars and South Eastern bullet trains! 35028 Clan Line on the Blackmore Vale Express and several VSOE excursions, including 2 running as 35017 Belgian Marine. 4965 Rood Ashton Hall on a St Valentines Day tour of Leicestershire and piloting 5043 to Didcot. 5029 Nunney Castle slogging over the Devon Banks to Plymouth and Par, and over Evershot and Bincombe banks to Weymouth. 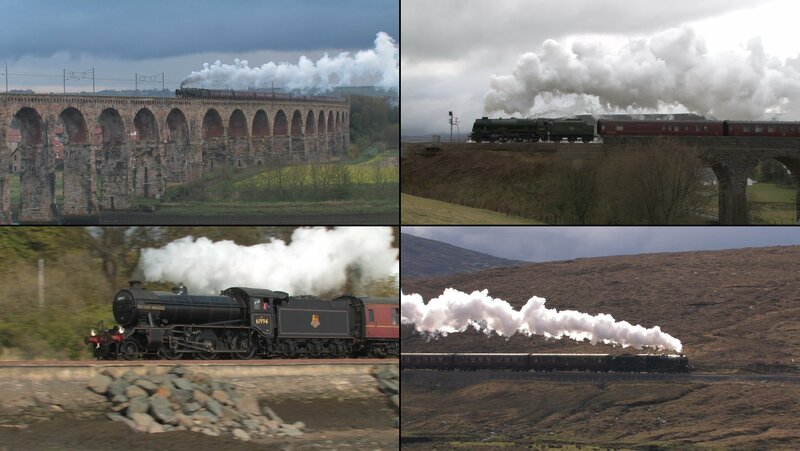 5043 Earl Of Mount Edgcumbe on The Red Rose climbing though Saddleworth and over Copy Pit, on the West Coast Main Line to Euston, and on the Great Western mainlines to Birmingham and Bristol. 6024 King Edward I on a train to Pembroke Dock and two trains to Shrewsbury in summer and winter. Pannier tank engines 9600 & L94 on Leicestershire branch lines. 6024 & 70013 double-heading over the Devon Banks. 5029 Climbing to Dainton Tunnel with the returning Cornishman, 10th July. An 8-day tour of Britain by train, with steam haulage, from London to Stirling, Mallaig, Chester, Swansea, Bristol and back to London. 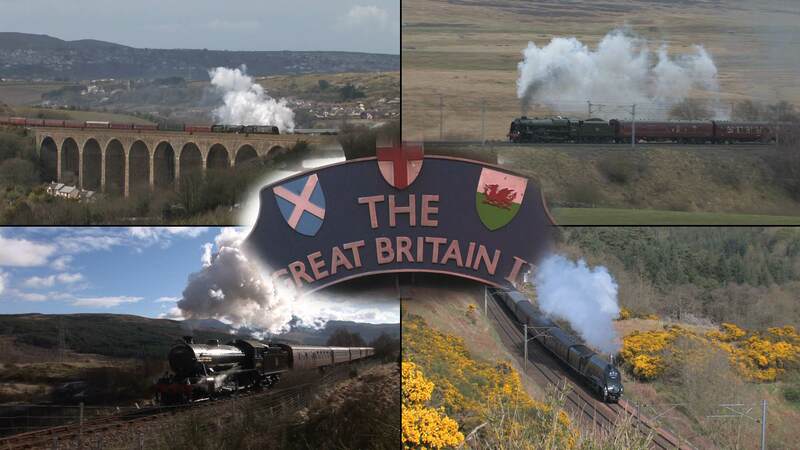 A 9-day tour of Britain by train, with steam haulage from London to Inverness, Wick to Penzance, and Bristol back to London. 46115 Scots Guardsman crossing the Forth Bridge, between Aberdeen and Inverness, and on the Glasgow & South Western. Black Fives 45407 & 44871 on the Far North line from Wick to Inverness, and the Highland Mainline over Drumochter summit. 61994 The Great Marquess on the line to Kyle Of Lochalsh on a still morning that produced some lovely reflections in the lochs. 5029 Nunney Castle on the Welsh Marches route, the Berks & Hants line and accelerating through Sonning cutting. 70013 Oliver Cromwell & Black Five 45305 between Bristol and Penzance. 6201 Princess Elizabeth in the south and on the North Wales coast. 6233 Duchess Of Sutherland on the East and West Coast Main Lines. 46115 Scots Guardsman with a train to Weymouth on the anniversary of the end of Southern steam. 5690 Leander working home from the Severn Valley Railway. 8F 48151 with trains to Blaenau Ffestiniog and Stanmore in Weardale. Black Five 44871 with trains to Weymouth, Swanage and Bristol. Black Five 45305 running from Birmingham to Euston. 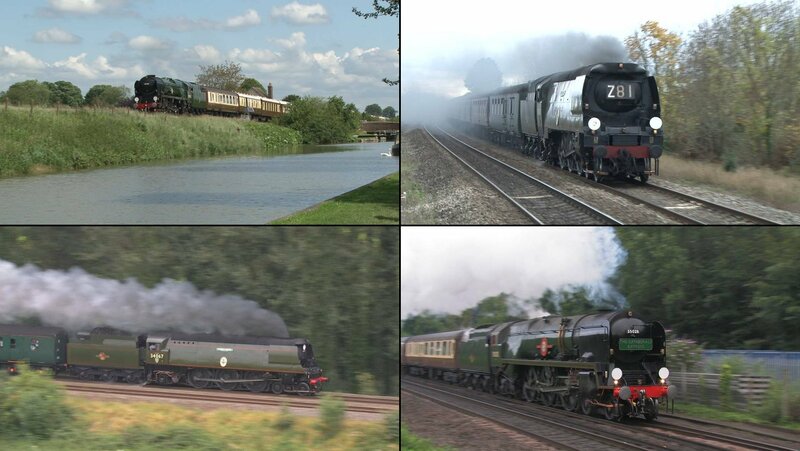 Black Five 44932 Summer trains to Caterbury, Bristol and Gloucester; Winter trains to Bristol, Yeovil and Oxford. On YouTube: Three clips that didn’t make it onto this volume, but are rather good. 70013 Oliver Cromwell. Includes the first train to cross the reinstated Sherringham level crossing, Ollie’s first trip over Shap in preservation, and a day trip to Windsor for the Girl Guides. 71000 Duke Of Gloucester. 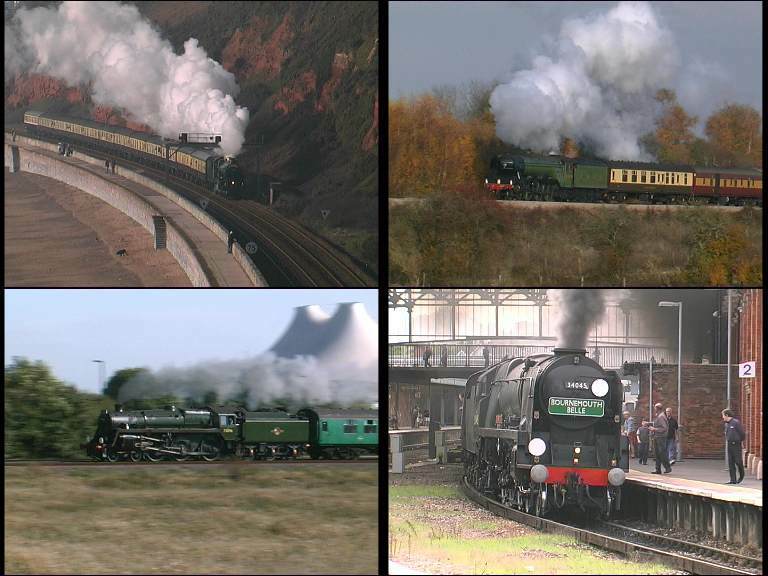 Deputising for Toarnado and Clan Line on the Torbay Express, Midland Tornado and VSOE. 60019 Bittern on the Dorset Coast Express, both the East Coast and West Coast main lines, and in Devon and Cornwall. 60007 Sir Nigel Gresley in the snow on the Berks & Hants. 60163 Tornado pulling Mallard to Shildon, hauling the Royal Train, in South Wales on St David’s Day, and on the Settle-Carlisle line. 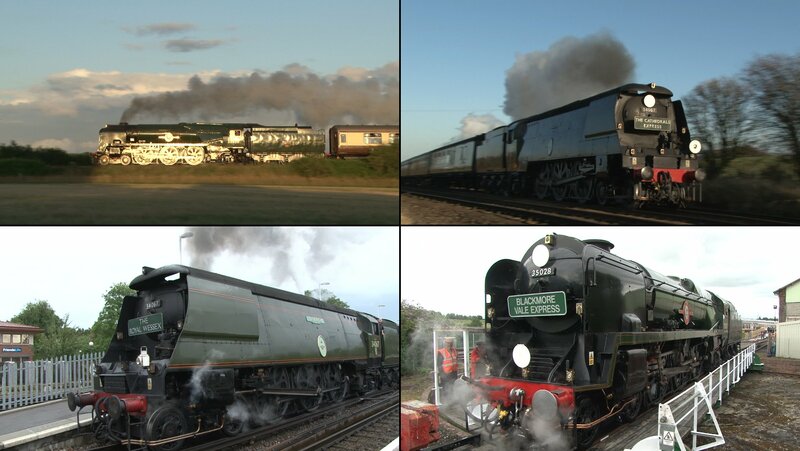 YouTube clip: 60019 with The Cornishman on 19th Sept.
30777 Sir Lamiel Includes a trip to Stratford and a compilation of the Dorset Coast Express trips shared with 60019 during the summer. 35028 Clan Line. 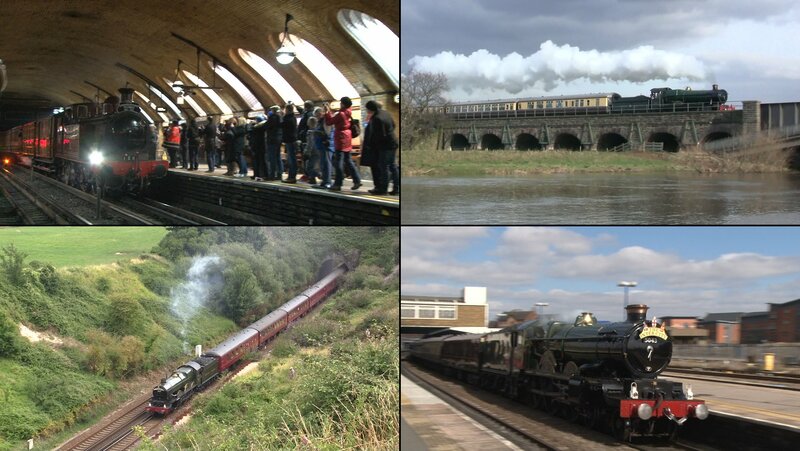 Highlights include the trip to Yeovil and Weymouth on 8th May, and Abinger Hammer in the snow, besides a couple of regular VSOE trains. 6024 King Edward I climbing Llanfihangle on her way to Ludlow. 5043 Earl Of Mount Edgcumbe with a special train to celebrate the re-openning of the terminus platforms at Birmingham Moor Street. YouTube clip: 777 with the Swanage Belle on 31st May. 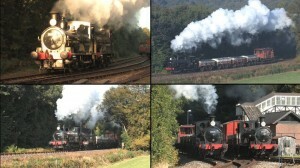 A second compilation of NRM locomotives at work on the Mainline, featuring 30777 Sir Lamiel and 70013 Oliver Cromwell. This disc contains a re-edited version of footage featured on Volumes 33, 34, 42 and 43, and features a discrete commentary, not normally included on Steam Age productions. Although commissioned by the South Of England Group of the Friends of the NRM, for various reasons they don’t currently have any in stock, so if you want a copy, you’ll have to come direct to Steam Age. 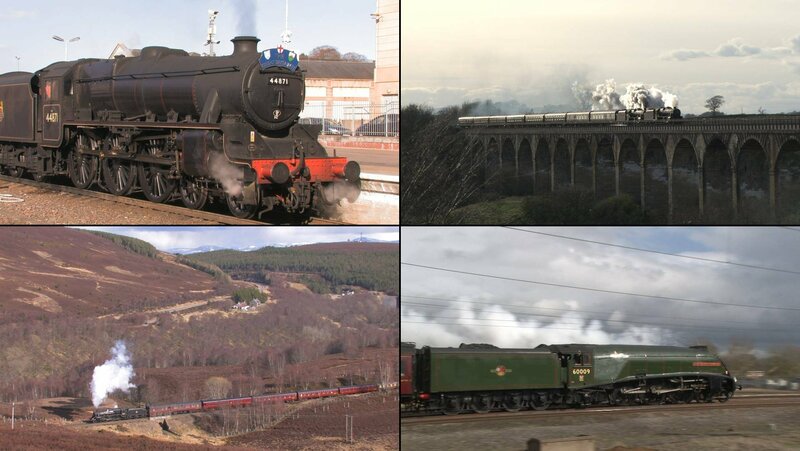 Filmed over 11 days in the north of England and west of Scotland: locations include Saddleworth, Shap, the Settle-Carlise line, Beattock, the West Highland line, the Oban branch and the Glasgow & South Western. K4 class 2-6-0 61994 The Great Marquess. 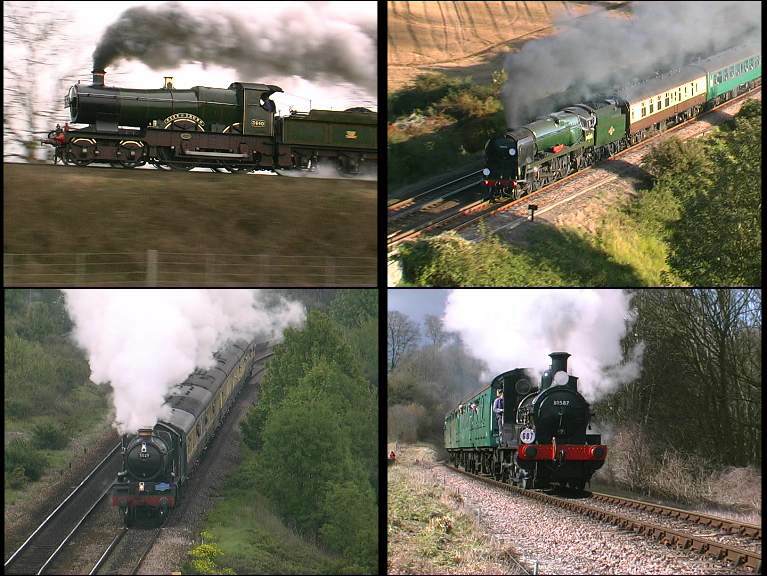 Five GWR 4-6-0 locomotives, two BR standard locos and a Western Region diesel hydraulic, at work on former GW routes – mostly! On two discs, a record of the mainline events that marked the 175th anniversary of the formation of the Great Western Railway. 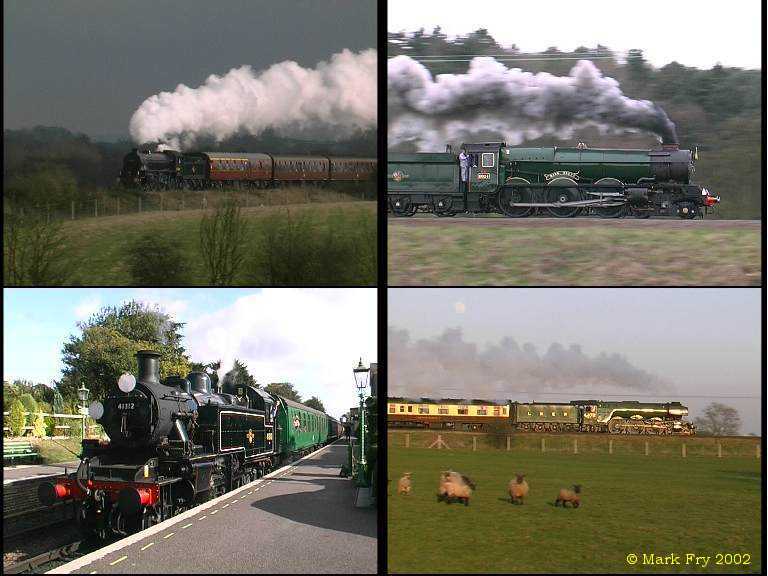 In Part 2: 11 tours, including the first mainline tour to visit the Chinnor & Princes Risborough Railway, Nunney Castle climbing Evershot and Bincombe banks unassisted and 5043’s record breaking run over the Settle-Carlisle line. 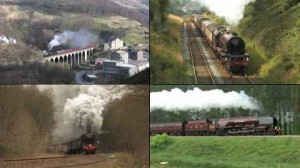 Featuring 5029 Nunney Castle, 5043 Earl Of Mount Edgcumbe, 6024 King Edward I, pannier tanks 9466 & 9600 and 5960 Leander. Special Offer: Buy Vol 35 and get Vol 36 half price. £15 for both DVDs or £22.50 for both Blu-ray Discs. On two discs, a record of the mainline events that marked the 175th anniversary of the Great Western Railway. 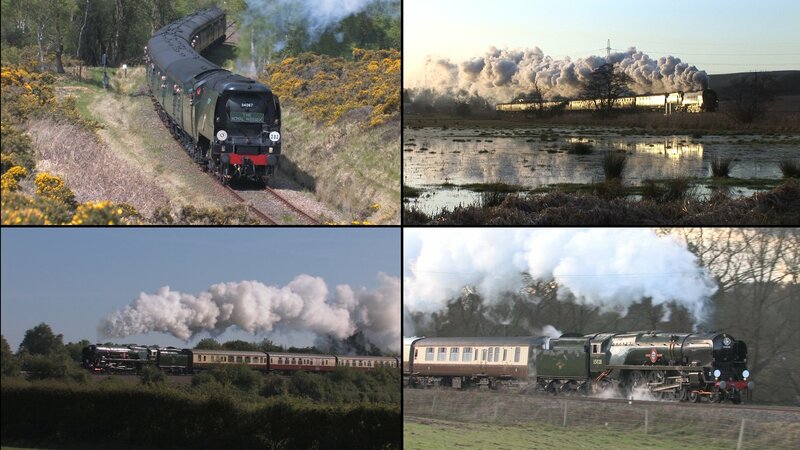 In Part 1: 11 tours including the record-breaking Bristolian, 9600 banking Lizzie on the Lickey Incline and Steam Dreams’ 2 day Cornish Riviera Express. 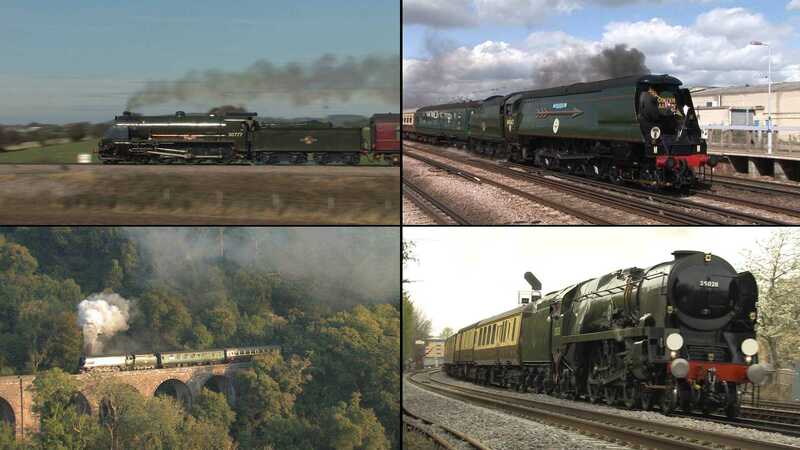 Featuring 4965 Rood Ashton Hall, 5972 Olton Hall, 5029 Nunney Castle, 5043 Earl Of Mount Edgcumbe, 6024 King Edward I, pannier tank 9600, 6201 Princess Elizabeth, 70013 Oliver Cromwell & D1015 Western Champion. On two discs, the whole story of a remarkable 9-day tour of Great Britain. In Part 2: Glasgow to Perth, Montrose, Aberdeen, Inverness, Kyle Of Lochalsh, Slochd, Aviemore, Drumochter, Edinburgh, Berwick, York and back to London. Featuring 70013 Oliver Cromwell, 61994 The Great Marquess, 6201 Princess Elizabeth, and 60019 Bittern. Special Offer: Buy Vol 34 and get Vol 33 half price. £15 for both DVDs or £22.50 for both Blu-ray Discs. The formula for this third grand tour of Great Britain was very similar to its predecessors, but in the days before the start, loco availability and the threat of a strike by signallers forced a number of late changes. Although the tour didn’t visit Penzance, Shrewsbury or Dumfries, and 30777 Sir Lamiel, 34067 Tangmere, 6100 Royal Scot and 46115 Scots Guardsman couldn’t take part, there were some very acceptable substitutes. 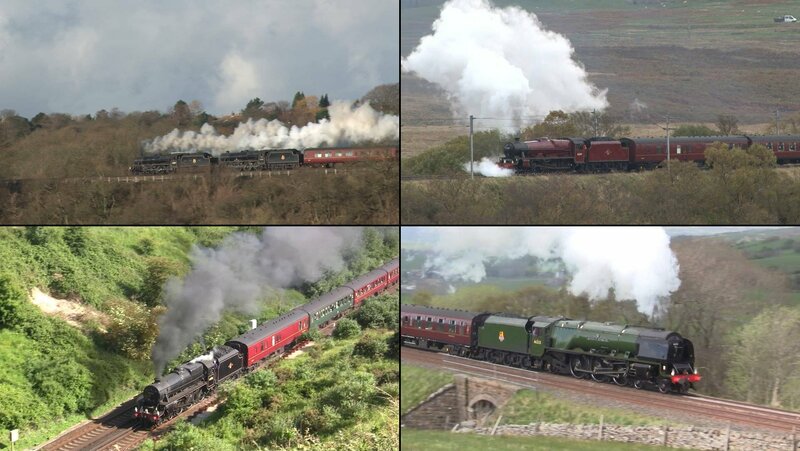 Day three included a double-headed run up the Lickey Incline, 44871 worked from Plymouth to Stranraer over four days, and 6201 Princess Elizabeth hauled the penultimate leg from Edinburgh to York. Most notable was 70013 Oliver Cromwell, which hauled the train from Plymouth to Inverness and back to Edinburgh on five out of seven days. Passengers renamed the tour “The Great Britannia” in Ollie’s honour! In Part 1: London to Bristol, Plymouth, the Devon banks, the Lickey Incline, Birmingham, Preston, Shap, Carlisle, Beattock, Glasgow, Ayr and Stranraer. 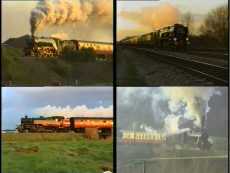 Featuring 5029 Nunney Castle, Black Fives 44871 & 45407, and 70013 Oliver Cromwell. The newest locomotive on the British railway network in 2009 was a steam loco! 60163 Tornado took 18 years to build and cost £3 million, and has become as well known as her great predecessors Flying Scotsman and Mallard. 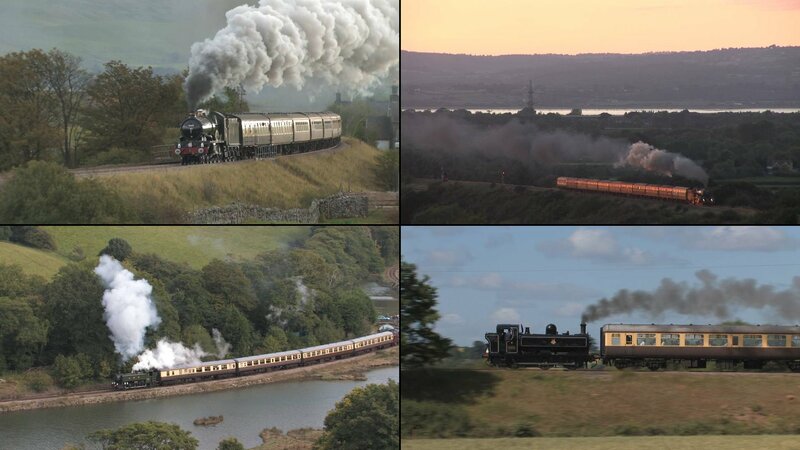 This programme shows her at work during her first year on the mainline, and includes the Royal Train, The Torbay Express, The Talisman, BBC Top Gear’s “Race to the North” and 12 other mainline tours, as well her visit to the Severn Valley Railway in October. 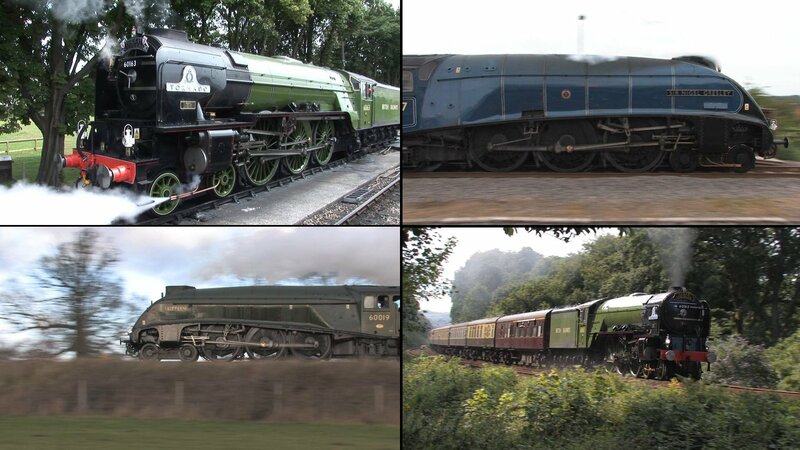 For good measure, we include 25 minutes of 60007 Sir Nigel Gresley and 60019 Bittern as well. Since returning to the mainline in August 2008, Oliver Cromwell has quickly established herself (all steam locomotives, like ships, are female) as a great favourite with enthusiasts and passengers. From Folkestone to Plymouth, from Poole to Carlisle, this volume records her progress around the country during the year. A three day trip, from Preston to Mallaig and back, hauled by Jubilee 5690 Leander, K4 61994 The Great Marquess and K1 62005. The route includes Shap and Beattock banks, the upper Clyde valley, the West Highland line past Loch Lomand and over County March summit, and the West Highland Extension to Mallaig, including Glenfinnan Viaduct. Two days in the company of the two surviving Beattie “Well Tank” locos on the Bodmin & Wenford Railway. Martin Creese of 30742 Charters organised two days of photographic charters and we were blessed with marvelous weather. 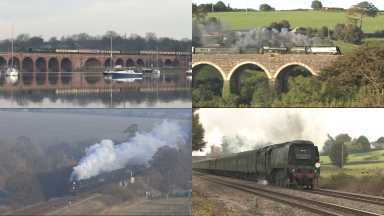 The Railway Touring Company ran its second marathon tour of Britain in April 2009: London to Penzance, Bristol, Shrewsbury, Carlisle, Glasgow, Inverness, Kyle of Lochalsh, Aberdeen, Edinburgh and finally York; eight days of steam haulage by Tangmere, Oliver Cromwell, Scots Guardsman, The Great Marquess, two Black Fives and Union of South Africa. 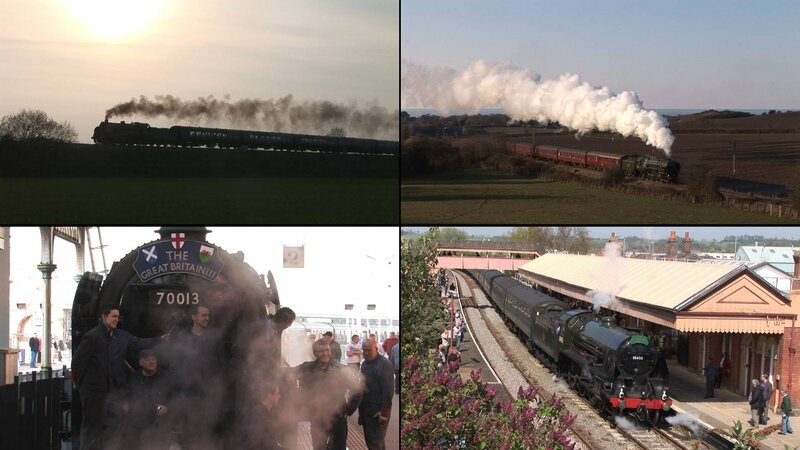 With three cameramen contributing footage, Steam Age Pictures got pretty comprehensive coverage. The hardest part was editing it all down to just 90 minutes. Having seen The Hero’s Return (Steam age Pictures Volume 17), about 850 Lord Nelson, the South Of England group of the Friends Of The National Railway museum asked for a disc that they could sell on NRM locomotives’ rail tours. This is the result. It covers 777 Sir Lamiel, 850 Lord Nelson and 70013 Oliver Cromwell at work on the British mainline mostly, but not entirely, in the South of England. Vol 26: Mainline 2008, Part 4: LNER & BR Pacific Locomotives. 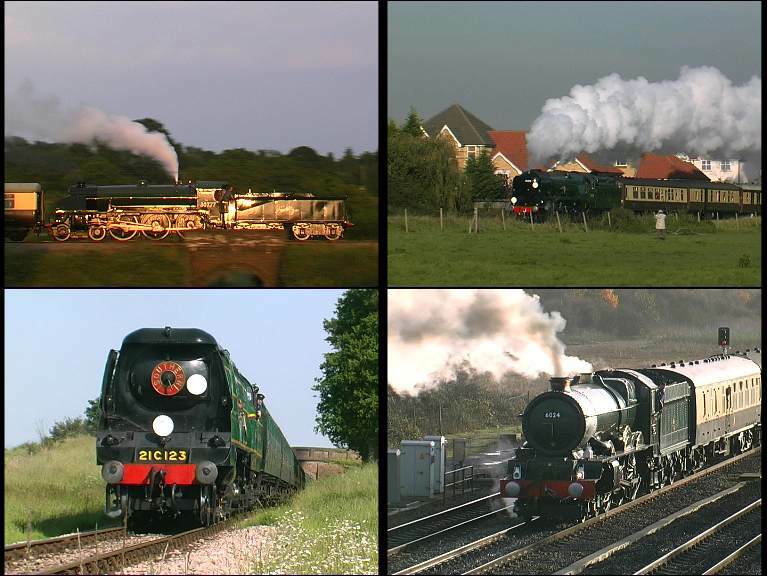 Featuring 4936 Kinlet Hall, 4965 Rood Ashton Hall, 5029 Nunney Castle, 5043 Earl Of Mount Edgecumbe and 6024 King Edward I. Featuring 8F 48151, Black 5s 45407 & 45231, 5690 Leander, 6201 Princess Elizabeth, 6233 Duchess Of Sutherland, 70013 Oliver Cromwell and BR Standard 4 76079. Includes the “15 Guinea Special” re-run. I was delighted by what I found when preparing this disc. As well as the large locomotives that we are still familiar with, such as Clan line and King Edward I, there’s a great selection of smaller engines, now much rarer on the mainline: the MHR’s U class mogul 31625, the Swanage Railway’s M7 tank engine 30053, and the Severn Valley’s “mighty moguls” LMS 2968 and GWR 7325. 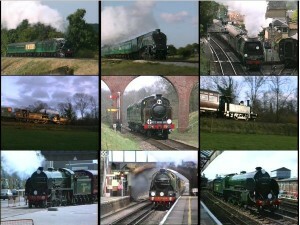 All this and the first mainline appearance of MHR’s fabulous “Green Five”, 73096, too. Only five locomotives here, and some longer views than normal, thanks to the wide open spaces of the Pennines and the Vale of York. Centre-piece is a 30 minute sequence dedicated to 60009 Union Of South Africa. She is seen on the Settle & Carlisle line, working from York to Harrogate and Scarborough and on two tours in the south. Also included are 6233 on Southern and Western metals, 6201 on the Welsh Marches route, 48151 working The Dalesman and 60019 Bittern’s midnight test run. There’s plenty of variety in this volume, with 7 GW locos, 2 BR Standards and 2 Southern locos. 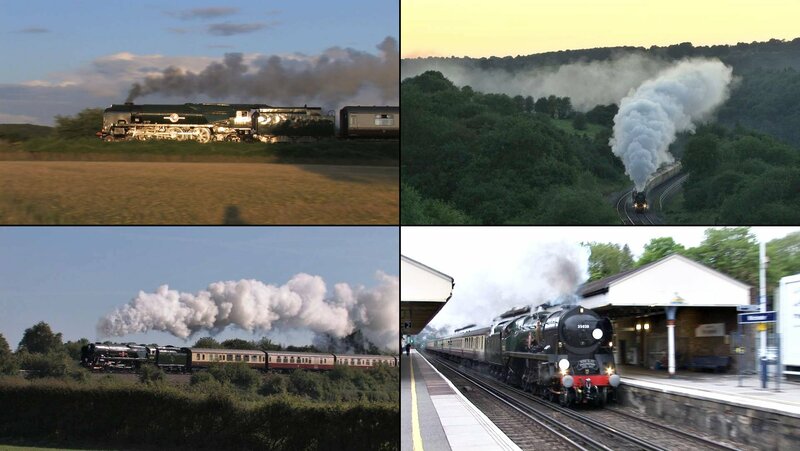 Highlights include Bradley Manor’s last mainline trips, 6024 and 5051 double-heading, fantastic glints from 9466 and 35028, Duke of Gloucester setting new standards on the South Devon Banks, and Sir Lamiel making a night departure from Salisbury. My personal favourite? Clan Line climbing Parkstone Bank, from a standing start at Poole, pulling 13 carriages and an EWS diesel, then roaring through Basingstoke, whistle open, really takes some beating! 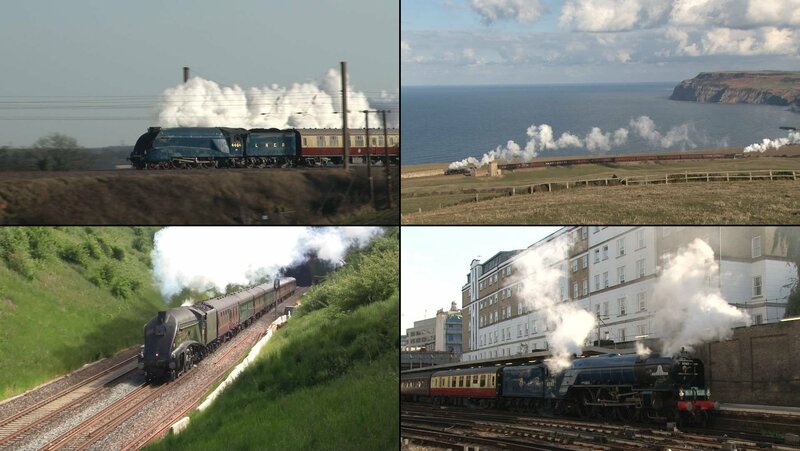 If someone organised a rail tour from Penzance to Thurso, using steam locomotives, would anyone buy tickets? In April 2007, The Railway Touring Company promoted just such a tour, and all the seats were sold months beforehand. Many more enthusiasts took to the road to record this great railway adventure, including cameramen from Steam Age Pictures & TWR Video. This programme shows you what we saw. 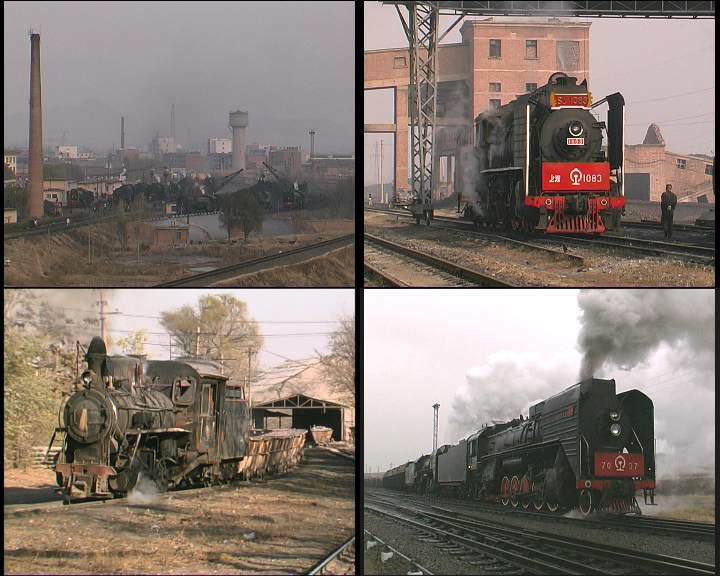 A group of friends spent a week driving and firing steam locos working everyday services on Polish Railways. I went along with my camera to record some of the goings on, and this programme is the result. 2006 provided an embarrassment of riches. Even after quite severe editing, there was too much material for a single disc. 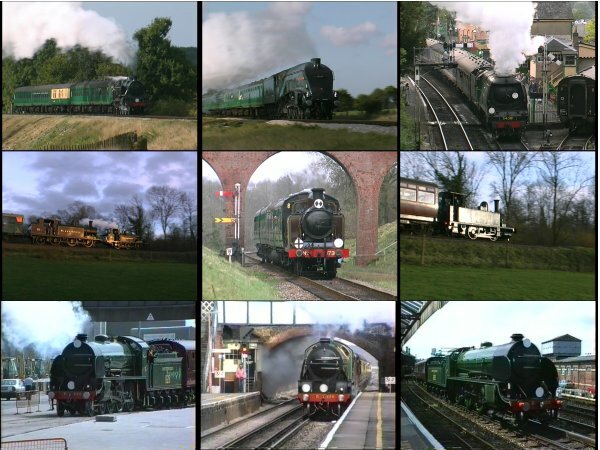 Rather than compromise on image quality, I decided to split it in two, with LMS and BR locos on Part 1 (Volume 11), GWR, LNER and Southern locos on Part 2 (Volume 12). 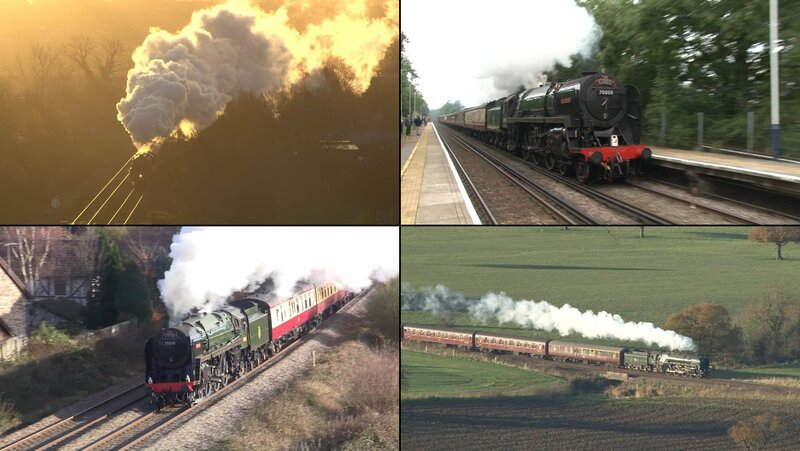 As a bonus, Volume 12 includes a short programme of two sunny days on the Bluebell Railway. 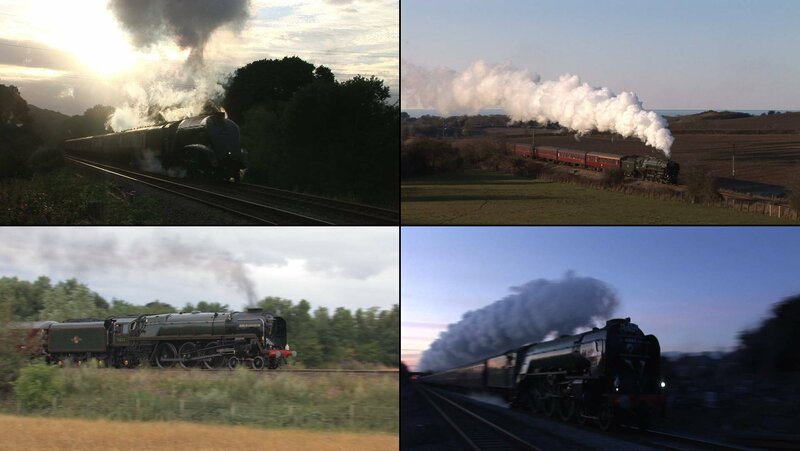 Part 1: All the locos are red or black – apart from 71000 Duke of Gloucester! 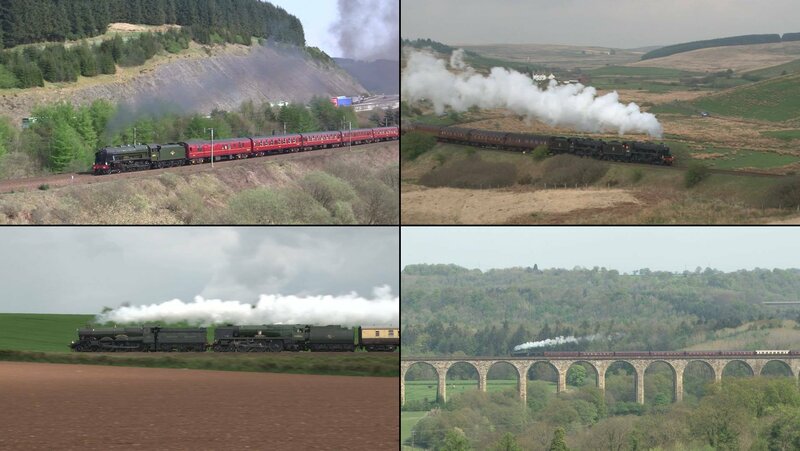 Highlights include 6233 Duchess of Sutherland in Surrey and Westmoreland, 5690 Leander on the Lickey, BR Standard Class 4 76079 on the Cambrian Coast, and 6201 Princess Elizabeth at Whiteball, Dainton and Rattery in fabulous sunshine! Vol 10: Mainline 2000; Steam On The Met. More from the archive, both S-VHS and Digital: Merchant Navy class 4-6-2, 35028 Clan Line at work on the main line between 1990 and 2001, plus an afternoon spent at Southall depot with members of the MNLPS. 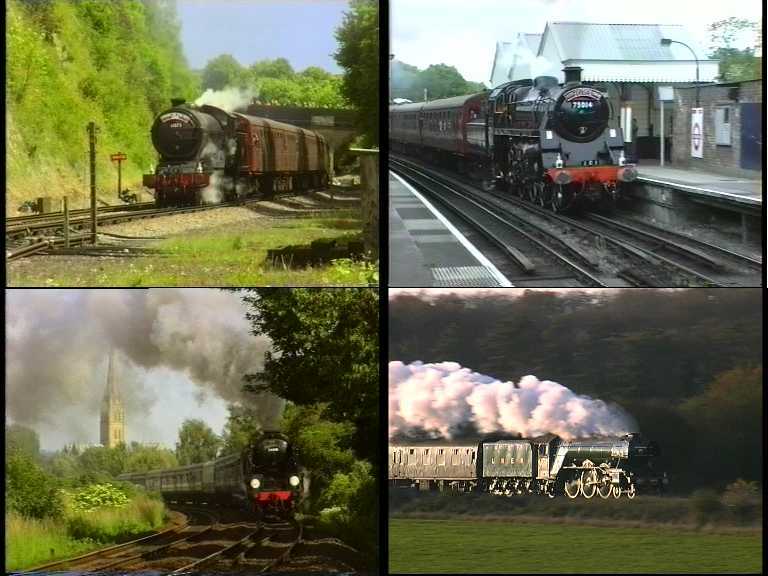 Three short programmes on one disc, covering galas at the Watercress and Bluebell railways, and a profile of Southern S15, E828. 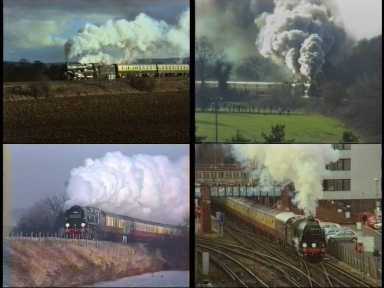 Mainline 2001: Highlights include double-headed Halls and Panniers in the snow, Clan Line’s last trip before overhaul, and Duchess of Sutherland in Devon. Well Tank Weekend: In April 2003, the Bodmin and Wenford Railway launched Beattie well tank no. 30587 into public service with a weekend of special trains. The weather was perfect, and the little engine is simply gorgeous!